Millions flock to water parks each year to cool off and have fun in the wave pools, meandering rivers, and waterslides. The World Waterpark Association states there are about 1,300 waterparks in North American that attracted 85 million people in 2015. According to the Travel Channel some of the top water amusement parks include Dollywood Splash Country, Schlitterbahn Waterpark, Wet ‘n’ Wild, Legoland, and Six Flags. How Safe Are Water Parks? Water parks can pose many safety hazards from shallow water, diving dangers, and drownings, to disease transmission, and slip and falls. 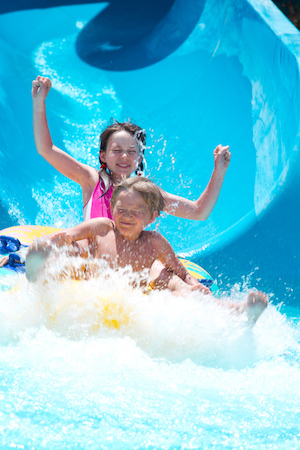 While there is no national hard data available for water park injuries, the Consumer Product Safety Commission and the Red Cross collected in 2015 lifeguard training data at waterparks which showed that 4,200 people a year are taken to emergency rooms to be treated for scrapes, concussions, broken limbs, spinal injuries and other such injuries suffered on public waterslides. Recently a young boy at The Wave amusement park in California was riding a new waterslide called the “Emerald Plunge” before hydroplaning off the ride onto cement. The slide is three-stories-tall, and drops riders at an 80-degree angle before flattening. Fortunately, the child walked away with minor injuries. You may remember the 2016 incident where a 10-year-old boy was riding the tallest water slide in the world – The Verrukt. It featured a 168-foot plummet, during which riders in three-person rafts traveled as fast as 45 miles per hour. A witness said it appeared the boy was ejected from his seat and slid down the ride. He died suffering a neck injury and decapitation. The ride is slated to be torn down. As a result of this incident, there has been renewed calls for greater safety oversight of amusement and water parks. So, you may wonder, in light of these incidents and concern for safety – who regulates water parks? The SafeParks website states that amusement ride safety in the United States is regulated through a patchwork of voluntary standards and federal, state, and local laws. Twenty states have government oversight over amusement and water parks, while nine have none at all. Inspection: Non-exempt rides must be inspected annually by a professional engineer or qualified inspector who certifies the ride meets state standards and NDT is up to date. State officials inspect fixed-site rides at non-exempt permanent parks every 6 months; portable rides at every setup. Investigation: State officials have authority to investigate serious accidents at carnivals and non-exempt permanent parks. Accidents at exempt facilities (large parks, trade shows) are not investigated by public safety authorities. Reporting: Non-exempt parks and traveling carnivals are required by law to report ride-related death or injury requiring immediate transport to a medical facility. Exempt facilities (large parks and trade shows) are exempt from mandatory reporting. In 2001, Disney, Universal and Busch voluntarily agreed to report medical symptoms of patrons who die or are immediately admitted to the hospital after riding their amusement rides. Water parks have a legal duty to provide employees and guests with a safe environment and premises. Some water park accidents result in ligation due to injuries sustained or a death of a loved one. Litigation maybe be the result of the waterpark’s negligence including defective design, defective machinery, poorly maintained rides or buildings, careless or inexperienced ride operators or lifeguards, lack of employee training, inadequate safety equipment, missing or lack of warning signs, slippery or uneven surfaces, polluted water, lack of lighting, and more. Water park lawsuits are often complex and require an experience attorney. Water parks can be owned and operated by more than one company. The various rides could be owned and or operated by separate companies. Even the employees may have their own personal liability. Learn to swim. It’s the best way to stay safe in, on and around the water. If you cannot perform the five steps of water competency in order, find a Red Cross swim class. Make sure lifeguards are on duty before you go in the water and follow all their instructions. Wear protective clothing, including a hat and some kind of cover-up for when you’ve had enough sun. Use sunscreen before leaving home and reapply during the day. Be prepared if soap and water aren’t available with a product like the new Red Cross alcohol-free hand sanitizer. Drink plenty of fluids – avoid drinks with sweeteners or caffeine. Parents – keep an eye on the kids. If they can’t swim or are less than four feet tall, have them wear a U.S. Coast Guard approved life jacket. Read the attraction signs and listen to all instructions given to you by the lifeguards. Obey the rules. Follow age and height requirements. Signal a lifeguard if you see someone is in trouble. Yell if you need to grab attention, but don’t go in after the person yourself. Set up a meeting place in case someone gets separated from your group. Use the buddy system to make sure no child is alone. Watch the weather and get out of the water at the first sign of lightning or the rumble of thunder. Stay indoors and away from water for 30 minutes after the last lightning flashes or thunder roars.